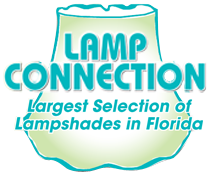 So let’s say you came into The Lamp Connection in Stuart to purchase a new lamp for a side table in your living room. You’ve found a perfect lamp and lampshade combination in the style that enhances the room. Before you leave, you’re not done yet. A finial that matches the style or theme of your lamp is the perfect finishing touch to add elegance and flair to the lamp, and the room. With hundreds of finials to choose from, ranging from the most basic to the most elegant, even to the most bright and unique, you’ll have seemingly endless options to finish off the design of your lamp. Let The Lamp Connection help you find the perfect finials and other lamp accessories for your lamp today. Lamp finials are caps put on the top of many lamps. Not all lamps have finials, but when the shade is braced by thin metal poles and attached to the lamp above the bulb, there is a screw in the center that usually needs to be covered. Many lamps have simple finials, often a ball of metal or painted wood that hides the screw and matches the look of the lamp. With over 900 styles to choose from at The Lamp Connection’s lamp, shade, and accessory showroom, you can choose from simple to elegant and everything in between. Fun fact: Finials don’t only belong on lamps. Flagpoles, sign posts, and even some buildings have finials on top to elevate style and theme. Think of a lamp finial as a hood ornament for your lamp. You don’t have to have one, but when it’s there it adds to the style of the lamp. Come into our showroom and you’ll find over 900 styles of lamp finials waiting to be considered for the finishing piece of your new lamp. Finials made of handcrafted glass, fine metals, wood, brass, vinyl, and more range from nautical themes to simple to elegant. You’ll find a turtle perched atop a gold metal cylinder, a Chinese-inspired porcelain dragon, a handcrafted glass cat, real seashells, porcelain fish, ceramic leaves, and many, many more, including the classic brass balls, bells, and simple shapes. In addition, The Lamp Connection can convert your chosen finial into a fan pull for a combination lamp and ceiling fan. Overwhelmed? With a selection this big, we understand. If you’re looking for something in particular, feel free to talk to one of our professional showroom staff, and we’ll be happy to guide you to what you might be looking for. To learn more, call (772) 221-0222 or visit our showroom.